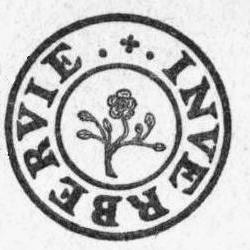 The parish of Bervie was disjoined from Kinneff in 1618. The coat of arms of the Royal Burgh of Inverbervie. Local Reports of the Commissioners, 1835: Inverbervie - "... is a very small town, and never was a place of any consequence"
The Reform Act plan of Inverbervie of 1832. 25-inch-to-a-mile Ordnance Survey plan of Inverbervie of 1868. 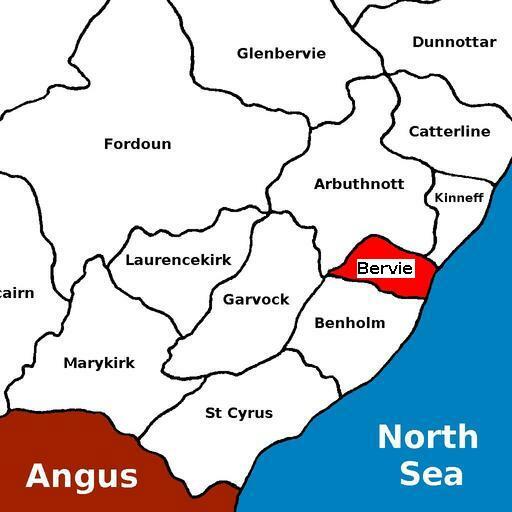 For the full range of maps of Bervie and Inverbervie, see National Library's Maps. Geograph.org: Inverbervie - recent photographs of Inverbervie. National Grid ref. NO8372. Geograph.org: Gourdon - recent photographs of Gourdon. National Grid ref. NO8270. The ruined former kirk is located at National Grid ref. NO831726. James Strachan younger ?-1649? M.A. St Andrews 1622; dep. Oct 1649 ? James Grindlay Small ?-1851-1888 b. 6 Feb 1817 Edinburgh, son of George Small, piano maker; d. 11 Feb 1888 Renfrew; mar. 1865 Jane Margaret Anderson; issue: Geo. G.; Agnes G.; Eliz. C.; James J.; Adam H.
Andrew Jervise recorded some monuments at Bervie in his "Epitaphs & Inscriptions", vol. 1, pp. 23-7. See also Bervie Churchyard and Bervie Cemetery. Burial records for Inverbervie and for Gourdon are held by the Registrar in Stonehaven. See Kincardine and Mearns Burial Grounds. Bervie was in the Commissariot of St Andrews. --- Scott of Halgreen ?-1799-? James Farquhar of Hallgreen ?-1846-1847-?